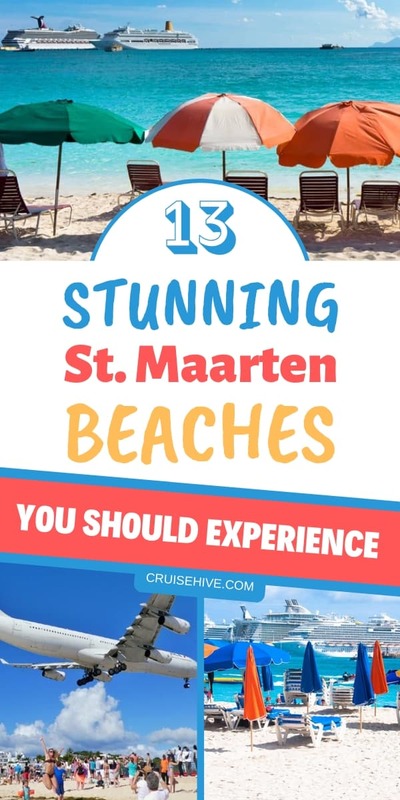 If you have a cruise vacation coming up in the Eastern Caribbean it might be worth finding out more about these stunning St.Martin/St. Maarten beaches. Find the right beach for you for spending your day in port. Disclaimer: Some of the links below will earn us a commission of any purchases are made. The popular cruise destination in the Eastern Caribbean has two sides and is known for being the smallest land mass to host two nations in one place. St. Martin is named as the French side and St. Maarten is named as the Dutch side. 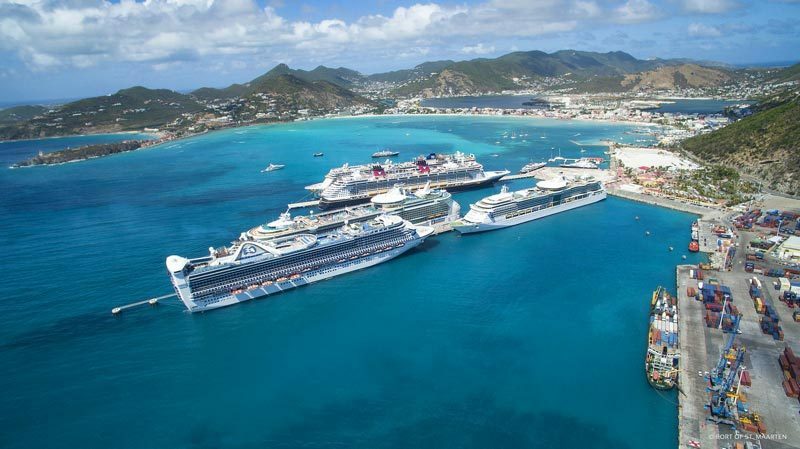 The major cruise ships will dock in Philipsburg located on the Dutch side. An invisible boundary divides the 37 km island into two countries. Other than the makeup of the country’s population, St. Maarten is also popular for its beaches. The island’s rugged coastline features 37 beaches all around. Before we get started, you’re going to need to check all these beach accessories. These beaches are unique and vary in features courtesy of the Caribbean and Atlantic sea that border the island on either side. While the Dutch side boasts of the closest beaches to the cruise port, the French side has some of the best. But all in all, both sides offer some of the greatest beaches in the Caribbean. Great Bay Beach is one of the closest beaches to the cruise port terminal in Philipsburg. It is located right at the heart of Philipsburg. This mile-long stretch of soft, white-sandy beach runs parallel to a long promenade stretching its entire length. Bars, restaurants, shops and other tourist shops spill out of front street along the promenade. Walking to this beach from the cruise pier is easy and possible, and there is always the option of a water taxi. The water taxi ride costs about $4 per person. This beach’s convenience makes it a hot spot for many tourists who are looking to relax and have some fun. So, go there early to get a good spot on the beach. Great Bay Beach is also a family beach which is kid-friendly so that the whole family can enjoy. The nearby amenities and close proximity to the ship make it a very popular choice for cruise guests. At least when you get hungry, you are within easy reach of a restaurant, or you can go back to the ship for lunch. Two beach chairs and an umbrella go for $20. Little Bay Beach is just right next to Great Bay Beach only separated by the Fort Amsterdam Peninsula. This Beach is a hidden gem found behind Divi resorts and makes for a perfect escape from the crowds. Little Bay beach is located West of the capital (Philipsburg) making the beach a little less busy and less crowded. You can take a taxi which charges about $6 per person to the beach. If you prefer to walk its about 20 minutes. Drop off at the resort and walk in between the buildings to get to the beach behind it. This beach is public, and you only need to rent chairs and umbrellas if you so wish. Little Bay has perfect calm crystal clear waters resultant from the protection offered by the peninsula. This makes it perfect for swimming and snorkeling. Visit this beach to enjoy a great beach break on its soft white sands and when you get hungry grab a bite at the nearby restaurants. Check these impressive Beach Foot Pads, definitely worth packing for your cruise. Maho Beach is a bucket list item for most tourists visiting St. Martin. 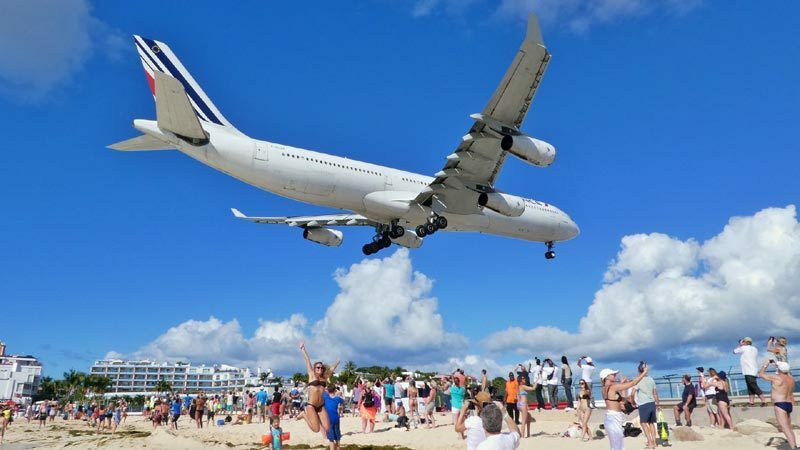 The beach which starts at the end of Princess Juliana Airport Runway attracts airplane fanatics, thrill seekers and even photographers. Most people visit the beach to see the Jumbo jets that fly over it at very close proximities when landing or taking off from the airport right next door. If this is something you would like to see and enjoy, then, by all means, visit Maho beach for this once in a lifetime experience. Get sandblasted by the jets as the plane fly by. However, if you are looking for a quieter beach, then this isn’t that beach, and you should probably try Mullet beach found nearby. A taxi ride to this beach costs approximately $16 a trip. One of the best beaches in St. Maarten is Mullet Bay Beach. This beach is found on the Dutch side of the island towards the southwestern ends. It’s perfect for a lazy beach day. It features clear, calm crystalline waters with soft white sand and sprawling palm trees. It’s located near Maho beach, and though you can see the airplanes flying above, they are usually far away and therefore less noisy. This beach is very popular with the locals during the weekends, but it’s also very tranquil and uncrowded during the weekdays. It has restaurants and bars, where you can get a bite or a drink from. It takes one about 25 minutes to get to the beach. A cab to the beach costs about $9 per person while a bus costs $2 per person. The clear crystal waters offer the perfect chance to snorkel, especially on the rockier shores. Grab a beach chair and umbrella and enjoy your day in port at this lovely beach. All sun protection wear can be found on Amazon by clicking here. Cupecoy Beach is located on the southwestern tip of the island and is the last beach on the way to the French side. It’s a long stretch of several white sandy beaches nestled at the foot of sapphire colored sand cliffs. These cliffs are eroded to create perfect small coves that create small secluded romantic beaches on their own. Being on the Caribbean seaside, the beach has the advantage of calmer waters which are good for swimming and just enjoying the beach. You can get to this beach via a taxi or a bus. Carry snacks and drinks though there are vendors on the beach. The sunset seen from Cupecoy is majestic, with views of Saba in the distance. It creates a very magical experience. Orient Bay is the most popular beach in St. Martin. It’s located on the northeastern coast of the French side. This white sandy beach is a sight to behold. Its turquoise blue waters hit the shorelines and leave a gushing atmosphere at its wake. Orient is a community beach where people mingle, lay in the sand, watch the sunset and the adjacent hills. It’s arguably famously known as the bikini beach as it entertains many lively parties and holds huge crowds of party people. It’s also a very active beach offering waters sports such as snorkeling, boat rides, volleyball, and all other common water sports. 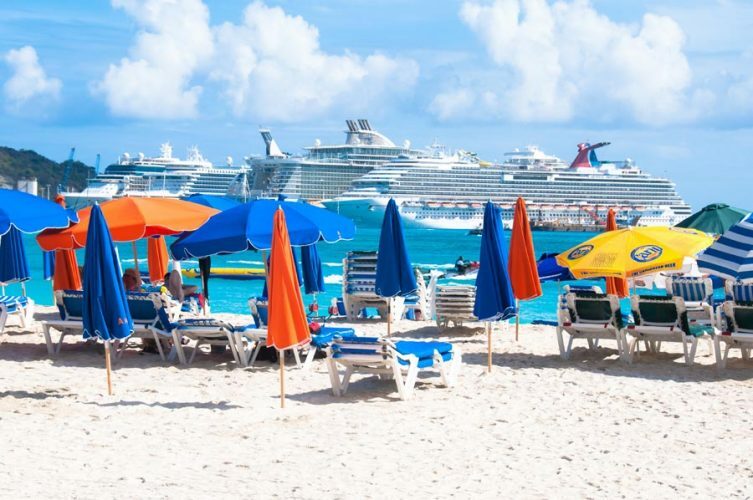 A 20minutes taxi ride from the cruise pier will get you to the beach. Vans are also available, and prices vary depending on the number of people on board. From the small pebbles found on the shore to its magnificent coastlines, you are bound to fall in love with the beach as you take a long stroll. Sunscreen can be expensive on the cruise ship, get yours here. Calm and clear azure waters with an excellent view of the Ocean is what greets you at Grand Case Beach. Located on the French side, the beach is only 30 minutes away. This beach presents a serene environment for laying back and just busking. It’s surrounded by perfect vistas of the ocean and lush hills. Visit the beach and enjoy the long crescent-shaped spread of soft white sandy beach. The beach also features great restaurants like the Rainbow café, popular for freshly caught fish dishes and cocktails. You can also take a stroll to the nearby market for the local cuisine. Where they serve fresh fish and lobsters for lunch among others. Grand case beach is a clean, tourist-friendly beach that you are bound to enjoy. This St. Martin beach is a bit far, about 45 minutes and 15 miles from the port but the entry and exit areas are easy and accessible. The fact that its semi-secluded makes it a good spot for relaxation. 1 mile away from Friars Bay Beach is a walking trail that takes you right into the heart of the open beach and the black rock formation. From the great restaurants to the funky music, you can’t afford to not love this beach. The lush vegetation that surrounds the beach also adds to its charm. Beach bumming is the main activity here, but you can also try the local’s favorite guava berry rum Coladas served at the little bars nearby. The waters on this beach are very inviting. Get a lounge chair and umbrella going for about $7, kick back and relax. If you get bored and want to try a different scene, you can visit Happy Bay beach which is just a short distance away. Water Shoes might be good for a day on the beach when snorkeling, get yours here. Excited about sunrise and sunsets? This is the beach for you. Dawn Beach offers spectacular views of sunrises. The powdery soft sand and coconut trees backdrop give it a magical atmosphere. It is located on the French side and is about a 20-minute ride from the port. It has become a popular destination for people ready to enjoy the sun rise and set while relaxing with a cocktail. This beach is as relaxing as relaxing gets; it even offers spa services to enhance the experience. Nature lovers have additional reasons to love this beach, owing to the fact that it’s located near the Oyster pond marina. You can take a tour of the nature reserve nearby as you explore the majestic beauty of the place. Pinel Beach is found in an island lying just a few yards off the east coast of Sint Martin. It’s named after a defeated captain who went after Saba and ran aground on the very same beach. Pinel has two breathtaking beaches. One beach faces Saint Martin and is a perfect stretch of sandbar with shallow, calm waters perfect for families with kids. While the other is a rocky beach that faces the other side and is exposed to the rough side of nature but bears beautiful rock formations. Take a water taxi to the island and enjoy the amazing beaches and scenery. The ride is only 10 minutes long. Baie Rouge or the RedBay beach is a gorgeous beach on the French side named so because of its pink sands. This beach offers a lively atmosphere that is perfect for beachgoers. This hidden gem is seldom crowded because it’s tricky to find. But once found, it’s truly worthwhile. You can rent two chairs and umbrellas for $20 and relax the day away. The crystal-clear waters beckon to beach bummers, and once you are in you might not get out till its time to head back. The beach is not far, and an affordable taxi ride takes you there. Competent swimmers should try this beach and swim out to the arch and enjoy the other hidden beach found at the base of the cliff. When you get hungry, visit the popular Chez Raymond for grilled foods and drinks. Get a waterproof case to protect your phone right here. Anse Marcel is one of St. Martin’s best kept secrets. This lovely, well-sheltered beach offers crystal-clear calm, warm waters that are perfect for swimming. The extended stretch of fine white sand is great, and the swaying palm trees offer respite from the harsh sun. A 15-minute taxi ride will get you to this beach. Where you can relax and just enjoy the beauty. The beach restaurants are currently closed due to hurricane Irma’s damage, but rebuilding is taking place. Galion Beach is very popular with families and adrenaline junkies. This beach is perfect for surfing and windsurfing. The swell is never too high thanks to its coral reefs. The coral reefs offer snorkelers a peek into St. Maarten water inhabitants. This is an active beach with water sports ranging from kayaking to paddle boarding. 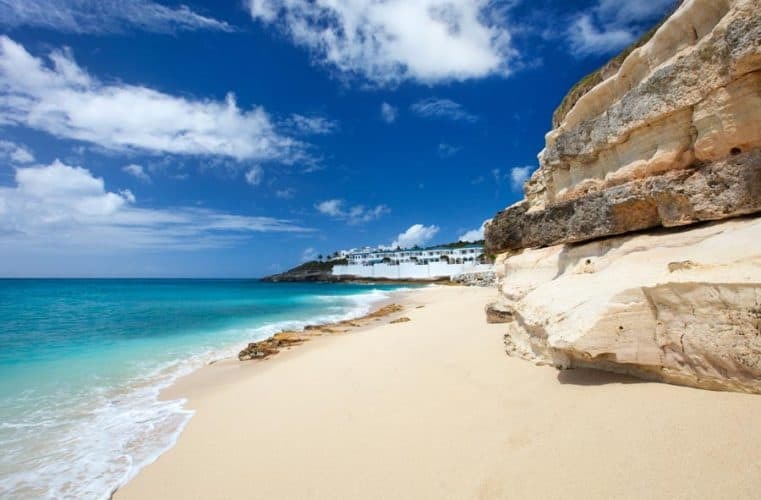 There you have it, 13 of the best beaches in Saint Martin. But don’t take our word for it see for yourself. If these beaches don’t meet your needs, then try any of the 24 remaining beaches you are sure to find what you are looking for. Luckily, given the island’s size, you can visit any beach within the few hours allowed in port. You only need to get to the port early. Please note that some of the beaches mentioned were heavily hit by hurricane Irma and are still rebuilding. Some include Orient Bay, Red bay and Anse Marcel. However, the good news is that the beaches are there and your favorite restaurants and resorts are hard at work rebuilding. With all that said remember to carry good water shoes, lots of sunscreen, your bathing suit and enjoy your cruise vacation. Happy Cruising! !